The Nest (self-catering for 4 + 2 children) is a charming terraced cottage with stunning views. Superbly tranquil yet only 5 minutes walk from the local village shops, pub and play park. Located on the southern edge of Errol village in the heart of Perthshire’s Carse of Gowrie, the cottage is cosy and characterful. Perfectly placed for exploring the local area with lovely walks nearby; 3 spectacular wedding venues are close - one within walking distance (the other 2 within a radius of 4 miles); polo events are held within Errol; sky-diving or horse-riding can also be achieved locally; it’s 2.3 miles to an award-winning café and local winery (tours! ); 10 miles to Dundee, ablaze with culture and just voted 6th on Lonely Planet's 'Best in Europe 2018' for its urban redevelopment, including the transformation of Dundee’s historic waterfront and forthcoming opening of the new Victoria & Albert Museum (15/09/18); only 10 miles to Perth too, with its own wonderful art galleries, museums, libraries, beautiful gardens and places of historic interest, not to mention a range of eateries and leisure opportunities; to reach the iconic Scone Palace it's 12 miles and Glamis Castle is 25 miles; golf opportunities exist locally and also at those celebrated courses - St Andrews, Gleneagles & Carnoustie - each within 29 miles; you can also fish or widen the net for other experiences! The Nest is superbly placed for 'stopping off' or for exploring other parts of Scotland. Seek and enjoy… whatever reason you are here for!! Transport links are good and the east coast, Edinburgh and Glasgow are all easily reached! Perched in a superb location, The Nest has 2 bedrooms: one with kingsize bed + en-suite, the other with twin 3ft beds and an adjacent shower room. These, together with a very well equipped kitchen and porch for dining, are located on the ground floor. A short flight of stairs leads to the atmospheric upper living room (unique views from a seated position!). For children, two very comfortable folding beds can be used in this area for a small extra charge. Free wi-fi, TV (freeview), books, games, and DVDs are available for relaxing times in The Nest and nearly all lighting is on dimmer switches, so you can create your own atmosphere! Outside there is a very pretty garden with mature plants, shrubs and a small sun trap area with seating for alfresco dining and soaking up the sun! Gas central heating, electricity and freshly prepared bed linens and towels are included. En-suite and shower room provide containers with soap, hand cream, shampoo and conditioner. There is free Wi-fi and a welcome basket with local wine, bread, butter, marmalade and eggs. Check in/out times are flexible where possible and agreed by arrangement. To book this truly delightful cottage, please click the enquiry button below to see availability and prices. 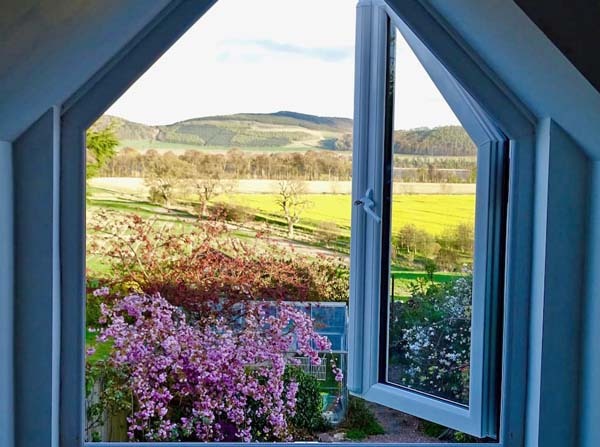 This vacation rental cottage in Errol is very well appointed and comfortable - perfect for exploring the Perthshire countryside and you can easily reach much of Scotland from here.